Lipo Laser Treatment: What are the Benefits? Lipo Laser Treatment: What are the Benefits? Lipo Laser Treatment: What are the Benefits? When people hear the word “lipo”, they immediately think of liposuction, the top cosmetic surgery in the U.S. But what if I told you there was an option that didn’t involve opening you up and leaving you down for weeks of recovery, but could still give you the same results? Meet Lipo Laser treatment. It is a much less invasive procedure and is a fantastic alternative to the much more involved liposuction. The laser treatment is revered as the safer option when it comes to surgically slimming down or removing excess fat from the body. It is a low-risk procedure. We all have those areas that are difficult to target even with everyday exercise and a healthy diet. There are problem areas for many people that just can’t seem to slim down. Whether it’s under the belly button or somewhere on your thighs, lipo laser treatment can do the work for you. Liposuction surgery requires you to be cut open in large segments so they can drain your fat. This often leaves scars if the stitches come out early or the cuts don’t heal right. Our lasers work on the exterior of your skin to penetrate through to the fat deposits. The lasers melt the fat and converts it into a liquid that can be drained through tiny dissections with a little vacuum pump. 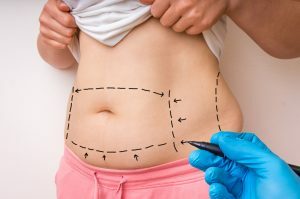 Liposuction creates such a sudden change in your body’s fat content that once the surgery is over, you have sagging skin for a long period of time post-op. With Lipo Laser treatment, not only will you avoid scarring, your skin won’t sag. Lipo lasers act as a tightening agent for the skin while it melts the fat in your targeted areas. Once the fat is drained, you won’t have rolls and rolls of extra skin that need to be adjusted and tightened, the laser will have already done that for you. With laser treatment, you’ll be back to work the next day. There is little to no downtime post-op with this smart procedure. Besides wearing a compression garment for a few weeks, there is little else you’ll need to worry about in terms of recovery. Liposuction surgery can put you out for weeks while you recover. You can’t exercise or do much physical activity either. Of course, pairing your treatments with regular exercise and a healthy diet can only help you achieve optimal results. When planning for a lipo laser treatment, consider changing your lifestyle habits to keep the fat off. Laser treatments are truly the smart option when considering options to melt your fat away. Not only is it less invasive, your skin won’t sag and you can get back to your normal schedule right after surgery! When you’re ready to change your body and your life with fantastic body contouring and great fat burning procedures, contact us. This entry was posted in Informational, News. Bookmark the permalink.